It’s very easy to decorate all kinds of Easter eggs with mod podge and paper napkins. The eggs that I used were cheap plastic eggs from the dollar store, but in years past I’ve also used this decoupage technique to decorate Window Surprise Eggs made with real eggshells. I expect that it would also work well for paper mache, wood, or styrofoam eggs. 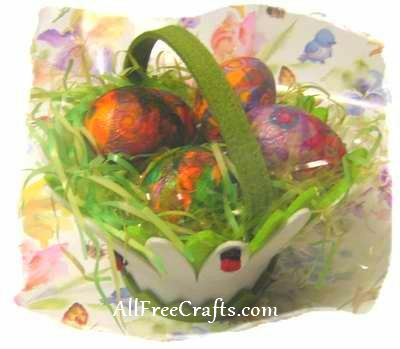 plastic Easter eggs (or try real hollow eggs, paper mache or wooden eggs etc. Paper napkins come in all sorts of designs and colors these days. The design isn’t crucially important for this project because you’ll only be using small pieces, but stripes, scrolls and other whirls and swirls will show up, along with any small pieces that you choose to cut out as a special theme or accent. Most plastic eggs have a tiny hole in the small end that is perfect for inserting the tip of a wooden skewer or wire stem. If so, use the skewer to hold up each egg as you work. If not, simply hold the egg with your fingertips on one end while you work on the other end, or place it in an egg cup or an egg carton and work on one end at a time, letting the finished end dry before turning the egg over and doing the other end. Take a paper napkin and, beginning at one corner, carefully separate the paper layers. Discard the lower layers and keep only the top layer with the printed design. If this layer tears as you separate it, don’t worry – you’ll be tearing it up lots more in a minute. You can either cut the paper napkin into small strips with scissors, or tear small pieces with your fingers. Torn pieces take a little longer to make but will smooth down onto the egg with less visible lines than cut edges. Use the foam brush to paint a small section of the egg with mod podge. Pick up a small piece of paper napkin and touch one small section of it against the mod podged area of the egg. Smooth down the rest of the piece with your fingers or the edge of the foam brush, working outwards until the entire piece is decoupaged to the egg. Repeat the previous step with another piece of paper napkin, overlapping the edge of it with the first piece. Don’t worry about minor wrinkles that occur. Some of them will dry out and the rest will blend in while adding a little bit of texture to the surface. Keep going like this until the egg is completely covered. Let the egg dry. If there is a special motif, such as a flower or bunny, that you want to feature on your eggs, apply it after the egg is first totally decoupaged and has had time to dry. If you mod podge more paper napkin over top of a wet layer, chances are the wet layer will shred and bunch up. Trust me on this. Once the egg has dried, you can apply another coat of mod podge to seal and strengthen it. Or you can add a bit of sparkle with a thin coat of spray glitter. Arrange the eggs in an Easter basket and set it out for the Easter bunny.